BOTTOM LINE: An immersive Shakespearean pub crawl that takes you to four bars where Shakespearean scenes are acted for the entire bar and audience to enjoy. It was a rainy, cold Saturday afternoon on the Upper East Side of New York city and dozens of people were packed into Bailey’s Corner Pub. They weren’t there to watch a college football game. They were there for to see Shakespeare...and to drink of course. 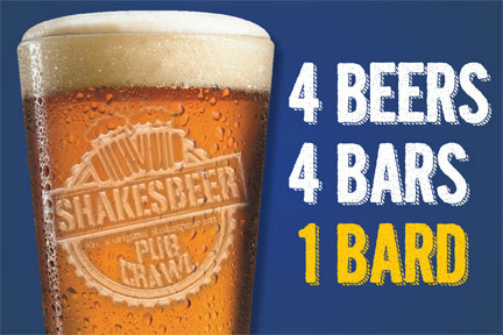 Shakespeare Exchange promotes their latest interactive offering ShakesBEER with the catch phrase: 4 Bars, 4 Beers, 1 Bard, and that is exactly what you get. For the bargain price of $45, the audience gets 4 drink tickets that can be used at any of the bars, and 4 roughly ten minute long Shakespearen scenes. What better way to spend a Saturday afternoon in New York City? The Bard comes to life at the different bars when a small pot is chimed to signify that the scene is about to begin. Next, the actors burst onto the scene, often coming from seats at various tables, at the bar, through the front door, or from the bathroom. The entire bar goes quiet for a few minutes as they are treated to some truly top notch Shakespearean work. Then they continue drinking and move onto the next bar to repeat the same cycle again. The scenes and locations are always different so you never know what you are going to get. This particular offering from The Taming of the Shrew presented an extremely smart and engaging scene brought to life by Brendan Averett and Eleanor Handley who managed to create characters who seemed right at home in this bar and caught levels of comedic nuances that are often missed in fully staged productions of this work. This was by far the highlight of this installment. Next, we moved to Eat End Tavern where I had an IPA and watched the forest folk of As You Like It hold court at the bar. Then off to Ryan's Daughter where I had some amazing house brew that reminded me of a Kilkenny and witnessed the shenanigans of Beatrice, Benedict, and Company from Much Ado About Nothing. Finally, the afternoon concluded at Five Mile Stone with an adaptation from several plays featuring Billy Shakes’s best pick up lines. At each venue, the company sells swag with some pretty bitchin' catch phrases if you are still looking for that perfect gift for that Shakespeare lover in your life. T-shirts that say “Lady M made me do it” and “I’d do Hamlet" would make great gifts. It's a novel concept that is really worth checking out. All the bars do a great job of handling the onslaught of people who flood into their respective establishments and most of the other patrons are excited to see the free show. I was near some people who appeared to have been "celebrating" for quite awhile at Ryan's Daughter, who didn't seemed to thrilled by the unexpected dose of culture but they really didn't have any choice. It's all par for the course when 40 people come into the bar all at once who are pumped to see Shakespeare and have some along the way. And for those of you who might be gluten free, or just simply don't enjoy the refreshing taste of a cold beer, don't worry, your drink tickets can also get you various drink specials not of the brewski variety as well. All in all, this is a pretty great way to spend a Saturday afternoon. Invite your friends, even your friends who claim they don’t like Shakespeare. They will have a good time. Everything is better after four drinks right? Not that you need the alcohol to enjoy the work that Shakespeare Exchange is presenting. It's Shakespeare for the people. The drinking people.